This is a great resource to help me include more math in my morning meetings. 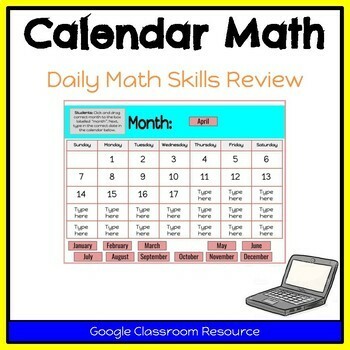 Do you teach Calendar Math for grades 1, 2 or 3? This pack includes a variety of questions/prompts for your whole group during Calendar Math. Students work at their own pace. This slide allows for differentiation. Assign a few slides or the entire presentation as you see fit. Students will practice fine motor skills as they drag and drop on certain slides. Each slide is in large print and easy to read. Only one skill covered on each slide. Use whole group for morning meetings or a quick review. You can also assign this using Google Classroom every morning (which is what I do). Students will have daily hands on practice with first and second grade math standards. You will need a Google account to use this product.